We made a safe crossing from Lisbon to the Canary Islands 630 miles and five days four nights at sea. 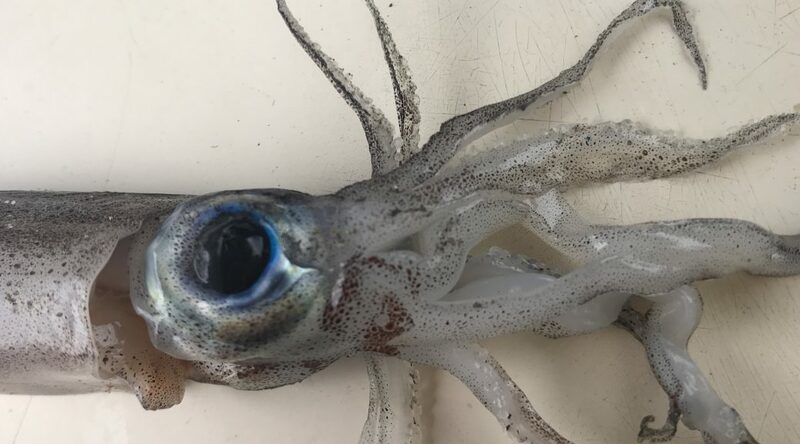 One morning a mini squid with little deep red flecks all over him and a large beautiful blue iridescent eye was found, not quite sure how he found his way into the deck but thankful he didn’t launch himself from the sea onto my face during night watch! We had steady winds the whole way which takes on its own personality when you come so reliant on it, at times calm and contained at others emotionally disruptive! However, consistent enough that we didn’t need to touch the sails much. The nights were dark when you feel a mixture of desolation and euphoria. Phosphorescent so bright though at times it looks like electric sparks scattering from the bow and further away you wonder if you are seeing oncoming boat lights. During the crossing you are able to get a small taste of what is experienced when on a longer crossing, after the initial anxiety getting away from the dangers of the coastline and the first night or two of slicing through the darkness you can start to appreciate the feeling of remoteness and your senses and not being connected to this fast paced world.